On Wed., July 20, Pine Tree Society honored the 2016 recipients of the Spirit of Pine Tree Society award. The profile below is the story of posthumous honoree Marie Preston. Learn more about the other honorees: Priority Learning of South Portland and Dave Johnson, owner of Kennebec Electric of Waterville. 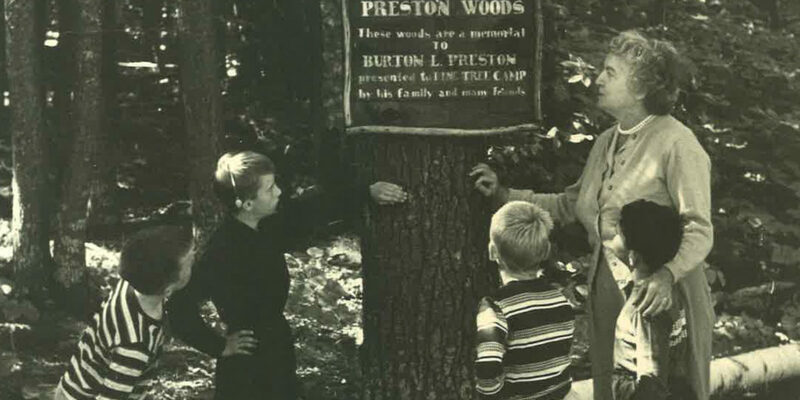 Marie Preston was the second Executive Director of Pine Tree Society – or Easter Seals as it was known — and was instrumental in establishing Pine Tree Camp in 1945. Her son, Jim Preston, was eight years old at the time and recalls that it was after the war that his mother became executive director. Newspaper articles from the time reveal Mrs. Marie I. Preston as a tireless advocate for people with disabilities. From spearheading conferences to leading fundraising efforts to running Pine Tree Camp and the Hyde Home in Bath, the Lewiston Daily Sun and Evening Journal made frequent mention of her efforts and accomplishments. She achieved much before she died in December 1956 at the age of 56. She opened Pine Tree Camp. She opened the Hyde Home. She was instrumental in the passage of Maine legislation providing for education of children with disabilities through the Department of Health and Welfare. Just a year before her death she completed plans for an adult rehabilitation program and workshop at Hyde Home. When asked what spurred her passion, Jim is sure it was her personal experience with polio that drove her. When Pine Tree Camp first opened Jim describes it as typical of the time. There was a main lodge where everyone came together for dining and there were individual cabins in the surrounding woods. He and his father, Burton Preston, worked together to get ten cabins ready for the first year. Jim spent five summers there with his mother. His father died when he was nine. He recalls how it was always a big deal to put the docks in at the start of the summer and that everybody helped out. “I’ve always been gratified by the experience,” he said. Mrs. Marie I. Preston instilled the spirit of Pine Tree Camp in her son and in all of us who carry on her legacy today. Thanks to her, thousands of people of all ages have been gratified by their experience at Pine Tree Camp.